No new projects…Just driving and enjoying! No new projects at the moment…mostly because new projects require money! 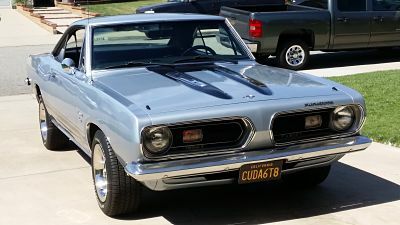 So I’ve been driving and enjoying the ‘Cuda as much as possible. The car drives fantastic (when it’s completely warmed up!). I actually had some guy go by me with the passenger hanging out the window taking pictures of the car as they drove by! The next “major” project will be a new radiator and electric fans – when I have the money. The temperature seems to crawl up on the freeway and I don’t like that!